Save your cutting board! Here are two replacement cutting strips for the Dahle model 507. While these aren't necessary for straight blades, they are necessary for any other type of blade. They are made out of a tough plastic that will last through many professional or crafting projects. we are using Dahl 558 Paper Trimmer, our current cutting strips damaged and looking for new one, please let me know the item code and availability. Thank you for your question. 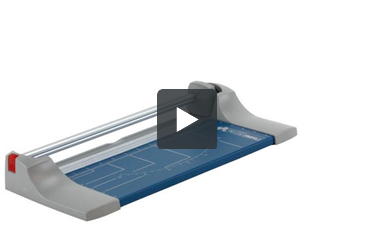 We reached out to Dahle and there is not a cutting strip on the Model 558 Professional 51 Inch Rolling Trimme. The clear plastic clamp that helps hold the paper in place is replaceable ut the "counter" blade that runs the cutting length is not able to be replaced. We are able to order parts directly from Dahle with the part number. Because parts are not able to be returned we like our customers to work directly with the manufacturer to be sure the correct part is being ordered. Dahle would be able to help clarify which part is needed. Their number is 1-800-955-1379 . Some manufacturer's do not sell directly to the public. If you are not able to purchase the part directly from the manufacturer, we are able to order that for you with the part number. Give our customer service department a call at 1-800-944-4573 and we can help you get the process started. I have a Dahle 507 personal trimmer and the blade won't cut. The claim is it sharpens itself. What do I need to do? To address technical issues the best first step is to contact the manufacturers technical support department. The manufacturer is Dahle and their phone number is (800) 995-1379 .